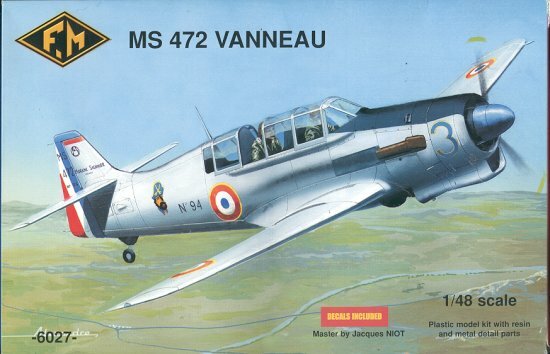 The trouble with these semi-obscure aircraft is that it is darn hard to find any information on them. It doesn't help when none is given in the instructions! Anyway, here is what I found about the MS 470 series of trainers. The MS 470.1 intermediate trainer prototype first flew in December 1944. An all metal, cantilever low-wing monoplane, the MS 470 housed the crew in tandem under a glazed canopy. It had inward retracting landing gear, the wheels of which turned through 90 degrees to lie partially exposed under the fuselage in case of a wheels-up landing. 500 production aircraft were built; 230 MS 472s with 640 hp Gnome-Rhone 14 M radials; 70 MS 474s (which were a navalized version of the 472); and 200 MS 475s with a 860 hp Hispano-Suiza 12Y45 liquid cooled engine. As you can see, this is a most typical French short run kit. The plastic is a bit soft with large sprue gates and flash to some degree on almost all of the parts. Detailing on the surface is very good with finely done engraved panel lines. The surface of the plastic is a bit rough so you'll probably end up sanding it prior to painting. I'd suggest going over the panel lines with a scriber to prevent their loss during sanding. The kit is designed to have separate engines for either the radial engined version or the liquid cooled version. This is the radial version so it includes that engine in the resin parts. Resin is used for the instrument consoles, seats and wheel wells. The resin parts are very well done. Cast metal is used for the instrument panels, landing gear legs, cowl flaps and a bunch of interior bits and pieces. These suffer from rather prominent mold seams and in some cases a bit of misalignment of the molds. A nice feature is that the floor of the cockpit is built into the lower wing. In addition, the upper and lower wing are each a single piece, so no worries about messing up the dihedral. There are two wheel hub designs and two props, though I'm not sure which prop is the correct one. Etched brass (not shown) is limited to the seat belts and one instrument panel (?). Not sure why they didn't include both panels as they have a lot more detail than the cast metal ones. No clear acetate with instruments is included. Two very well done vac canopies are provided in a nice, thick plastic when compared to earlier kits. Instructions are better than previous ones and actually offer a history of the type and a lot more info that I found for the intro section. The construction sequences are well drawn and the difference between metal and resin bits are clearly shown. There are also a few drawings that show how parts are to look when the assembly is complete. Another very nice addition is that F.M. is starting to do color information as well. Markings are provided for two planes, both quite similar in that they are both bare metal with matte black anti-glare panels. 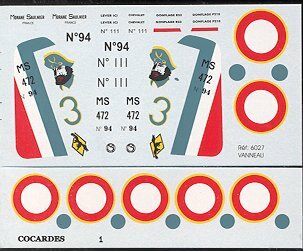 This time the well printed sheet offers full colors for the rudder stripes. It appears that the second of the two planes does not carry these stripes, though they are faintly outlined on the sheet. Perhaps because the serial of only one is printed on the decal stripes, one has to paint the stripes for the second plane. In comparison to earlier F.M. kits, this one shows a lot of improvement in terms of instructions and the vac parts. Perhaps it has been the incessant whining of reviewers that has helped! Now if they could do something about the roughness of the molds, they'd really have made a major improvement. This is a kit that is not for the beginner and one that any modeler with several short run kits under their belt should be able to complete without any real traumas. I know that I'm going to take the plunge and give this one a try, just because it is such an unusual subject.